Despite the Arab world being predominantly associated in Europe with jihadism, war and refuge, its activists, intellectuals and artists are rarely seen or heard here. This applies even more to feminist and gender-critical initiatives from the Arab world. With European stereotypes of patriarchal societies and anti-Muslim racism, women’s political views, alternative narratives, and perspectives from Arab societies are often silenced and with them their hopes, doubts, assessments, and analyses. The diversity of feminist and gender-critical initiatives in times of crisis and war is the starting point of this panel discussion. Questions which will be discussed with activists and academics from different generations are: how do various feminist and gender-critical initiatives assess their developments in recent years? How do these actors relate to the respective authoritarian, repressive state? What is the relationship between Islamic and so-called ‘secular’ women initiatives? How important is this line of division? How can a common ground for basic political demands be found for the entire region? Which conflicts between feminist, women’s and gender policy actors in Europe are necessary and what kind of cooperation is possible? 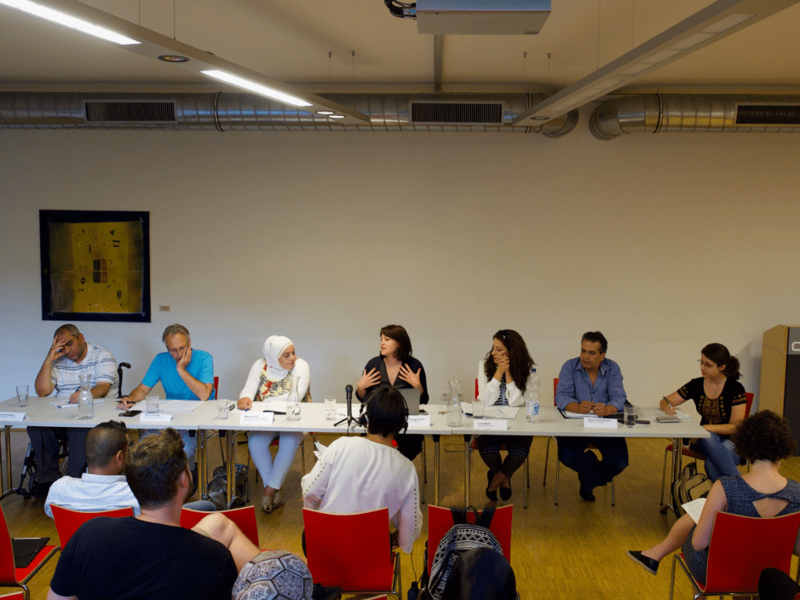 In July, the second summer school of the APPEAR project Rooting Research in the Palestinian Context II took place at the University of Vienna. Continuing the discussions of the first summer school in Beirut in 2017, the participants further engaged with the overall question of what it means to change perspectives of knowledge production in/on Palestine and Palestinian communities in their different localities. The summer school was mainly held in Arabic with English translation and was joined by more than 15 colleagues from the West Bank, Jordan and Lebanon as well as by various students and academic staff from the University of Vienna and Klagenfurt. The participants from the Gaza Strip were not able to exit Gaza in time, due to the ongoing closure and occupation policies by the Israeli and restrictions by the Egyptian authorities. Out of five participants, just Ali Abuzaid, project coordinator at Al-Azhar university could reach Vienna participants. The first two days started with the presentations of preliminary results of the ongoing research projects of the participants of the fieldworkers and MA training program. Topics like the effects of renting apartments to Syrian refugees in Burj Barajneh camp in Lebanon, alternative models of tourism and other income generating projects in the West Bank, the difficult living conditions of Palestinians from Gaza in Jordan, as well as social media as a space for youth activism portrait the multiple contexts from which these research topics have been developed and investigated. The summer school also provided space to engage with epistemic and methodological challenges the colleagues face during their research processes. The importance of the political, social and economic context of the different research topics was repeatedly negotiated in various sessions. Ali Abu Zaid, project coordinator from Al Azhar University, joined the summer school via Skype and talked about research challenges in Gaza between internal divisions and the ongoing siege. 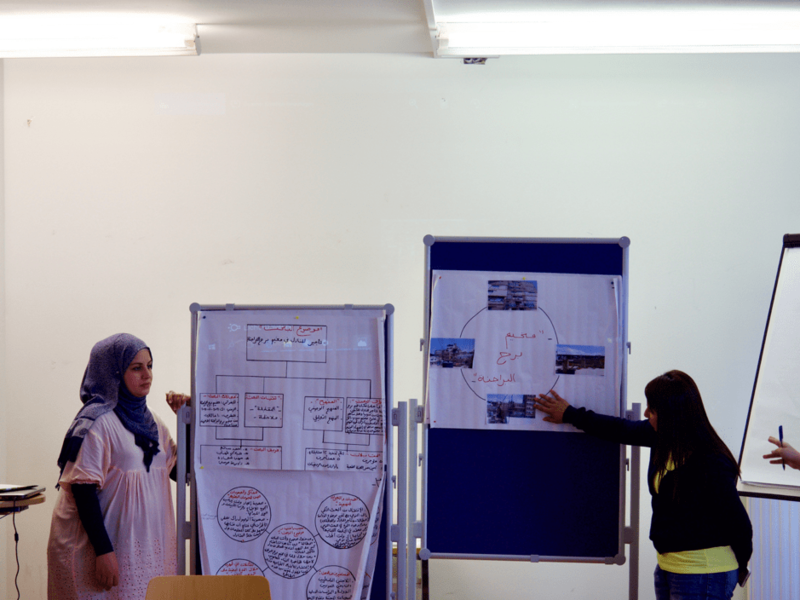 Manal E’Mar, project coordinator from the Community Development Center in Zarqa, reflected on possibilities and limitations of research and community work in Palestinian camps in Jordan. How particular knowledge can not only be linked to different (colonial) power relations on the ground, but also to research on resistance was a central question throughout the summer school. Furthermore, how research results could be directly communicated and reported back to the various Palestinian communities in the different localities in and outside Palestine, was one of the main challenging debates throughout the workshop led by Ayman Abdul Majeed. He additionally reflected on lessons learnt in the last years of the APPEAR project in researching in the West Bank, the Gaza Strip and the diaspora. Building on the various presentations, Helmut Krieger together with the participants reflected on the linkages between politics and research, the power relations inherent in so called objective and subjective research processes, on possibilities of engaged research and it’s constant negotiation with Palestinian communities. He raised the question which kind of knowledge can and needs to be produced in times of crisis of the Palestinian movement, imperialism and colonialism? The analysis of these power structures also made it necessary to point to racist structures within the global development industry, which was tackled by Beatriz Gomez from the University of Vienna in her workshop Racism and Knowledge in Development Contexts. On Thursday, the summer school started with two presentations that focussed on historical perspectives of knowledge production in the context of crisis and revolution. Kassem Sabah, director of Mousawat, analysed biographies and writings of three Islamic intellectuals – Ibn Taymiyyah 1263-1328), Abdelrahman El Kawajbi (1855-1902) and Sayyed Qutb (1906-1966). Klaudia Rottenschlager from the University of Vienna and Maya Zebdawi from the Lebanese University discussed the history of the PLO Research Center in Beirut between 1965 and 1982. They provided a framework to discuss the rich historical knowledge and particular research strategies that have been produced by an earlier generation of researchers and focussed on the legacies of the establishment of Palestinian Studies during this specific time. Lena Meari, director of the Women’s Studies Institute at Birzeit University, connected these historical perspectives with her ongoing research and engagement with female Palestinian political prisoners. She shed light on the intertwinement between epistemological positions, ontological assumptions, political sensibilities, decolonial methodologies and liberatory knowledge production in the context of settler colonialism in Palestine. Meari discussed practical as well as theoretical challenges of her ongoing research process which provided the participants with first hand insights of such a complex field of studying resistance within the colonial prison system. A roundtable discussion on critical perspectives and engaged research in imperial and colonial times was opened up to the public on Thursday evening. 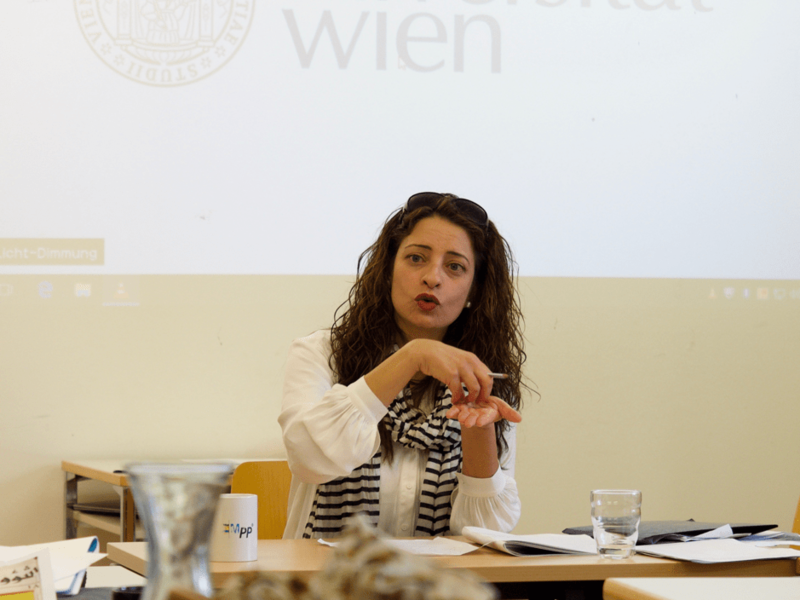 It provided a unique opportunity for students and other colleagues living in Vienna to personally engage with the different project partners from Lebanon, Jordan and Palestine and to discuss limits as well as possibilities of conducting joint research as academics, NGOs and activists. How such critical perspectives can be connected to emancipatory political and social struggles not only in the Global South but also in Europe, has to be constantly negotiated through building up trust and networks between different communities. 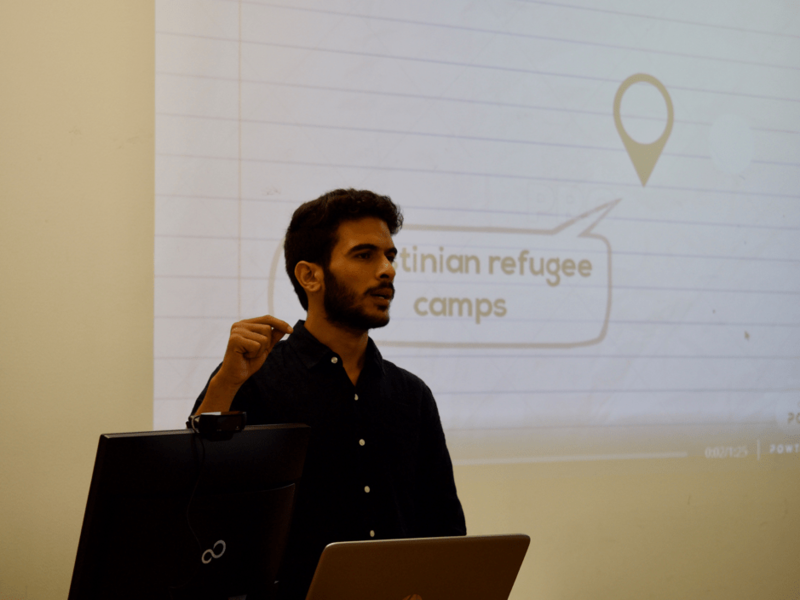 The last day of the summer school was dedicated to future perspectives, not only for the APPEAR project but also of alternative development and resistance in Palestinian communities. After a concluding ceremony at the University of Vienna, the participants enjoyed their last evening together at the Prater area in Vienna. Click here to download the program of the summer school. Eine Welt im Ohr Radiosendung über die Summer School zu “Critical Perspectives and Engaged Research in the Palestinian Context”. Hier geht es zur Sendung. Weitere Teilnehmende an der Summerschool. Gast | Dr. Helmut Krieger, Projektkoordinator ROOTDEVPAL, Sozialwissenschafter, wissenschaftlicher Mitarbeiter am Institut für Internationale Entwicklung, Universität Wien, und Konsulent beim Vienna Institute for International Dialogue and Cooperation (VIDC). Musik | Mario – Orient Experiment, Sonic Ahmed – mashkenka, Snowflake _ ccMixter – Peace Around the World _ditto ditto feat. Freedom People, CHRISS ONAC – Belle Vision. Nachzuhören auf Jamendo, eine Community für freie, legale und unlimitierte Musik, die unter Creative Commons Lizenzen veröffentlicht wurde. Stay updated about the event on Facebook!